I teach coupon classes, frugal living and budgeting classes in East Texas, the Midsouth and online. Classes are tailored to your group’s specific needs. I also lead a women’s couponing and frugal living Bible Study. 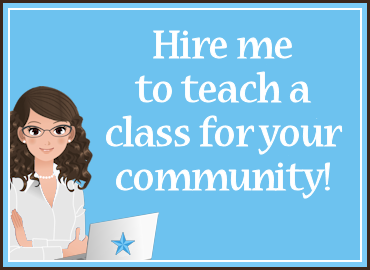 Please e-mail me for information on classes or speaking engagements. I love to hear from my readers – I’m here to help and encourage! Feel free to ask any questions you have about thrifty shopping or being thrifty at home. I also love to receive tips that can be posted here at Thrifty Texas Penny. If you’re on Facebook you can also post questions, tips or success stories on the Thrifty Texas Penny wall there. My passion is to help you learn how to save money on the things you need to buy and learn to save money by being more efficient at home. I teach quarterly classes here in Tyler and am available to teach both private and public classes. Please e-mail me for more rates and information on the classes available. If you are interested in advertising on Thrifty Texas Penny you can view my advertising rates and options here.